Did you know there was a way to repair and restore your old copper water lines without completely replacing them? The solution is an internal epoxy coating, which is a thick fluid that coats and seals water pipes to stop leaks and prevent future leaks. Why Do Copper Water Lines Leak? Copper water pipes are rated to last 50 years or longer, but some residential building and homeowners in Chicago can see their copper water lines start to fail is as little as 15 years. Unfortunately, the early deterioration of the copper lines is usually environmental and not due to a manufacturing flaw in the copper itself. Copper water supply pipes are under constant pressure. Residential homes should never have a water pressure higher than 80psi, and while high-rise buildings may need water pressure over 80psi to reach the highest floors, steps should be taken to ensure the water pressure does not exceed the capacity of the copper water pipes. Otherwise, fitting and joints could fail, and if they fail on a pressurized water pipe, the water damage could be extensive. The water itself can also cause pinhole leaks and corrosion. This occurs when the water flowing into your Chicago building from the municipal water system is acidic. The acidic properties of the water slowly eat away at the copper, causing pits. The pits become pinhole leaks, which can cause water damage if they are not repaired promptly. Thankfully, epoxy lining can successfully stop pinhole leaks and prevent further corrosion of your copper water pipes. 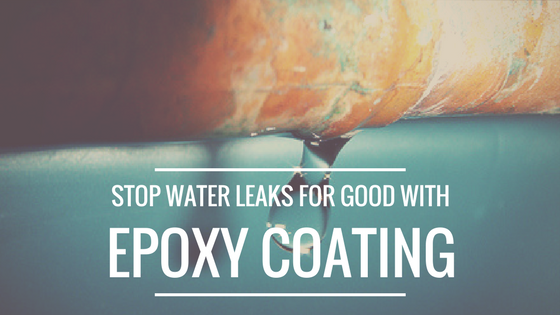 How Does an Epoxy Coating Stop Water Leaks? Epoxy is a viscous fluids that coat and seal as they move through a potable water pipe. The fluidic nature of the epoxy ensures that it coats over every inch of the internal diameter of the pipe, including any pits, pinholes and cracks, as it is blown through the pipe. Once the coating cures, it becomes hard, creating a waterproof barrier that prevents further corrosion of the host pipe. What Is the Process for Installing an Epoxy Lining? Installing epoxy linings involves a four-step process. First, our epoxy installers inspect your plumbing pipes and perform any spot repairs that may be needed. Next, your potable water pipes are thoroughly cleaned, smoothed and dried, which prepares the pipe to accept the epoxy coating. Then, our professional installers connect the specialized equipment to your pipes and prepare the epoxy mixture. The mixture is blown through your pipes where it is left to cure for about 24 hours. After the coating has cured, the pipes are returned to service. This quick process means that your pipes can be returned to service faster than with a traditional pipe replacement. How Can Nu Flow of Chicago Help Me Refurbish My Copper Water Lines? Nu Flow of Chicago can help you refurbish your copper water lines with an epoxy coating so that you do not have to completely replace your plumbing system. 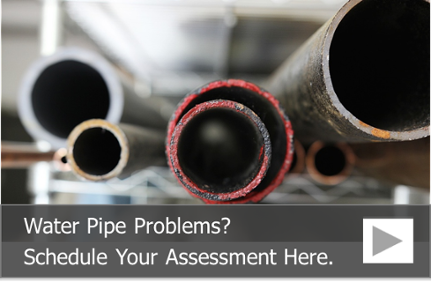 It all starts with a whole building pipe assessment. This assessment is designed to provide you with a detailed camera inspection of all the pipes you want coated and a recommendation either for or against installing an internal epoxy pipe coating. If your plumbing pipes are good candidates for the epoxy coating process, we will provide you with a detailed estimate that you can take to your building’s board members, management company or owner in order to get approval for the pipe lining process. To learn more about how the epoxy pipe coating process can stop pinhole leaks in your copper pipes and to schedule a building pipe assessment, call us at 815-790-9000.